2. B.Optom Admission Test Online Application deadline : 05 November, 2018. 8. College Name: Institute of Community Ophthalmology (ICO), Pahartali, Chattogram. a. Students who have passed the Secondary or equivalent examinations between 2015 and 2016 and any higher secondary examination of 2017 and 2018 from any of the Board of Education of Bangladesh. b. SSC/equivalent and HSC/equivalent examinations for all education programs in country and abroad will be at least 8.00 and GPA 3.50 in any examination. There are SSC and HSC both examination must have Physics and Biology. 1. At first your a color Photograph scan and a candidate signature save your computer your any folder. 3. City Bank Account No 3102474337001 Pay Tk. 1000/-. Institute of Community Ophthalmology (ICO) Bachelor Science of Optometry (B.Optom) published admit Card at 07 November, 2018 to 12 November, 2018 can Download Admit Card. You can download http://icoedu.org/apply-online/. Institute of Community Ophthalmology (ICO) Bachelor Science of Optometry (B.Optom) published Test Examination Seat Plan Admission authority will published http://icoedu.org/. 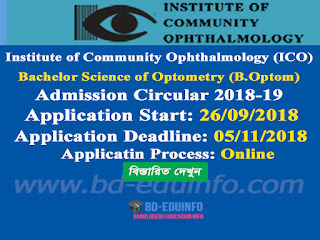 Institute of Community Ophthalmology (ICO) Bachelor Science of Optometry (B.Optom) published will published Admission waiting list result their Official website http://icoedu.org/. You can search their Admission Test Roll Number. 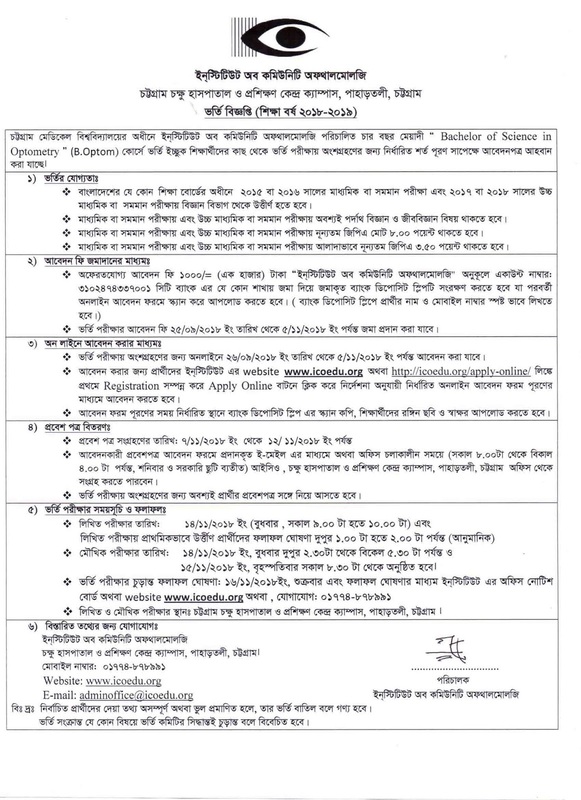 Tags: Bachelor Science of Optometry (B.Optom), www icoedu org, Bangladesh Dental College (BDS), Institute of Community Ophthalmology (ICO) Admission Circular 2018, Institute of Community Ophthalmology (ICO) Admission Test Result 2018-2019, B.Optom Admission Circular, B.Optom Admission Notice, B.Optom Admit Card Download, B.Optom Seat Plan, B.Optom Admission Mark Distribution, Institute of Community Ophthalmology (ICO Admission Test Mark Distribution, Institute of Community Ophthalmology (ICO Admission Test Result. 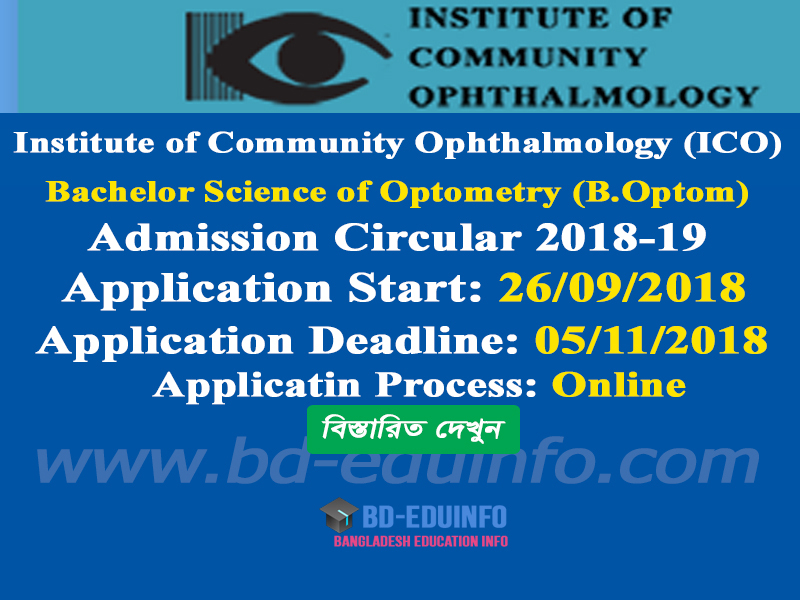 Bachelor Science of Optometry (B.Optom), www icoedu org, Bangladesh Dental College (BDS), Institute of Community Ophthalmology (ICO) Admission Circular 2018, Institute of Community Ophthalmology (ICO) Admission Test Result 2018-2019, B.Optom Admission Circular, B.Optom Admission Notice, B.Optom Admit Card Download, B.Optom Seat Plan, B.Optom Admission Mark Distribution, Institute of Community Ophthalmology (ICO Admission Test Mark Distribution, Institute of Community Ophthalmology (ICO Admission Test Result.